Teaching swimming and water safety can be an enormously rewarding job. Being able to swim gives us the opportunity to take part in fun, enjoyable water exercise and maintain cardiovascular health. For kids, swimming is a source of great fun and excitement for those that have confidence and can swim. For others it can be a source of fear and anxiety. Those that do have the confidence may not have the swimming ability, and without them knowing the water is a source of great danger. Teaching kids how to swim is a fundamental part of their early development in life and should be treated with equal importance. Understanding water conditions is an essential part of participating in many outdoor activities. Most people will learn to swim at a swimming pool, which is the safest environment in which to learn. It can also be a calm and relaxing place to learn how to overcome the fear of water. The emphasis must be on safety when teaching swimming and water safety. Swimming pools and open water areas such as lakes and rivers are an attractive source of fun and entertainment and as a result quite often the dangers of water can be overlooked. their strength and therefore ability to move around in the water, with or without floatation aids, also increases. This in turn opens up a whole world of fun and enjoyment. This brings us to the next most important reason to learn to swim: fun. 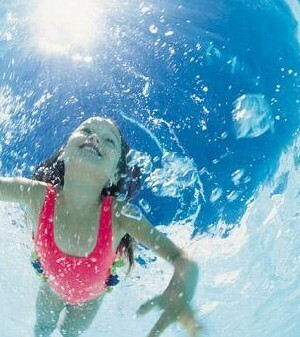 It is important to note, that children should always be supervised around water, regardless of their swimming ability. The most competent of swimmers can get into trouble at any time and in any water environment. Nobody is drown-proof! However despite the safe environment of the swimming pool, there are still about 15 deaths by drowning in swimming pools each year in Great Britain. But when you consider that there are about 350 million visits to public swimming pools each year, plus many visits to pools in hotels, gyms, holiday parks and at home, the swimming pool remains a safe environment. The Government has recognised that it is essential that children learn about the principles and skills of water safety and survival, which is why swimming is a compulsory component of the PE curriculum in primary schools. By the age of 11 all children must be able to safely swim a minimum of 25 metres.